The second coming of NEKROMANT is upon you ! We proudly present the album “SNAKES & LIARS”. More than a year has passed since this blues-laced metal band released their debut, an album which was recieved with great warmth by critics and metalfans alike. Even though the band changed their name from “SERPENT”, nothing in their sound or approach to music was altered. 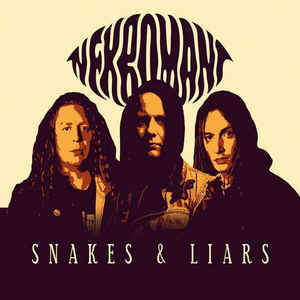 NEKROMANT is still about heavy metal made from pure admiration for the music, which is abundantly clear on this album. Fast-paced facemelters like “Stoned to Death, Doomed to Die” share space with darkened and psychotic tracks such as “Never Saved” and “Funeral Worship”, all accompanied by lamenting lyrics. NEKROMANT still wear their inspirations on their sleeves and if heavy riffs interest you even in the slightest, this is your thing. SKU: N/A. Categories: CD-Distribution, DISTRIBUTION, VINYL-Distribution, VINYL-RECORDS. Tags: Stoner Rock, Transubstance Records.